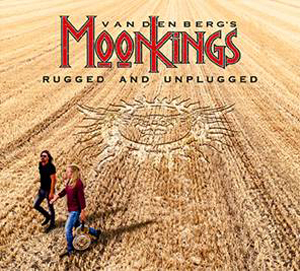 VANDENBERG’S MOONKINGS and Mascot Records/Mascot Label Group will release Rugged and Unplugged globally on November 23. The album is a beautifully stripped back acoustic album which features songs from across Adrian Vandenberg’s career. From his first band TEASER as a 20 year old he has always used an acoustic guitar in his recordings, which along with the electric guitar creates the light and shade dynamic that is the cornerstone to all of his records. This project created the opportunity to strip down the big orchestral arrangements on songs such as "What Doesn’t Kill You" and "Breathing" to just Vandenberg on acoustic guitar and the voice of Jan Hoving. His 1983 hit "Burning Heart" gets a stunning reworking, “my favourite singers ever since my teens have always been guys like Paul Rodgers and David Coverdale. Since I wrote this song in 1981, I've always pictured it sung by a singer with such a tone of voice and vocal abilities. Jan is absolutely such a singer as you can hear,” he explains. "One Step Behind" has a graceful warmth and "Walk Away" feels both intimate and anthemic. Like the two MOONKINGS albums, MoonKings (2014) and MK II (2017) it was produced by Adrian Vandenberg himself. It was recorded between Vandenberg’s home studio and Jan Hoving’s farm which gives it the relaxed, intimate and natural feel, away from the clinical studio environment. It is Vandenberg and Hoving doing what they do and love the most, playing music straight from the heart. The complete track listing features “What Doesn’t Kill You”, “Sailing Ships”, “Out Of Reach”, “One Step Behind”, “Burning Heart”, “Walk Away”, “Breathing” and “Sundown”. The album will be available in LP + MP3, CD, and digital formats. A pre-order is now live HERE.